UN Global Compact, The Norwegian Government, and engaged companies announced last at Cermaq headquarters in Oslo the launch of the Business Action Platform for Oceans. . Cermaq is one of the world’s leading companies in farming of salmon and trout, with operations in Norway, Chile and Canada. It is a fully owned subsidiary of Mitsubishi Corporation. 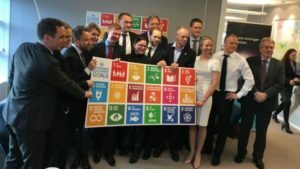 The Norwegian aquaculture company is the first company to join this new UN sustainability initiative. For the first time business will take a leading role in addressing ocean sustainability in the UN. The platform will be formally based in the UN Global Compact, the private sector initiative of the UN. – On behalf of Cermaq, I am honored to host this Announcement of the Business Action Platform for Oceans, Thomas Palm Cermaq’s CFO said at the event. The Ocean Action Platform is one of several partnerships initiatives managed by UN Global Compact. This initiative focuses on SDG14 Life Below Water, and will engage UN partners, private sector partners, government partners, academia, and NGOs. The Sustainable Development Goals are integrated in Cermaq’s strategy, in the way we do business, and we are focusing on five goals where we have the most impact. And of course – Goal 14 Life Below Water is a key priority for Cermaq. To find solutions to the SDGs and make progress on ocean sustainability, partnership is crucial. Sustainability is deeply rooted in our culture, and Cermaq’s approach through many years has been to engage in collaboration to address material sustainability issues in our industry and value chain. – We are very proud to be the first business partner for this initiative – ocean challenges must be solved through multi-stakeholder dialogue, between governments, business, research institutions and civil society. And we believe the UN Global Compact will be an excellent arena for this dialogue, says Thomas Palm. The formal launch will take place in New York in June when the full participation in the initiative has been determined. February 8, 2018 in News.